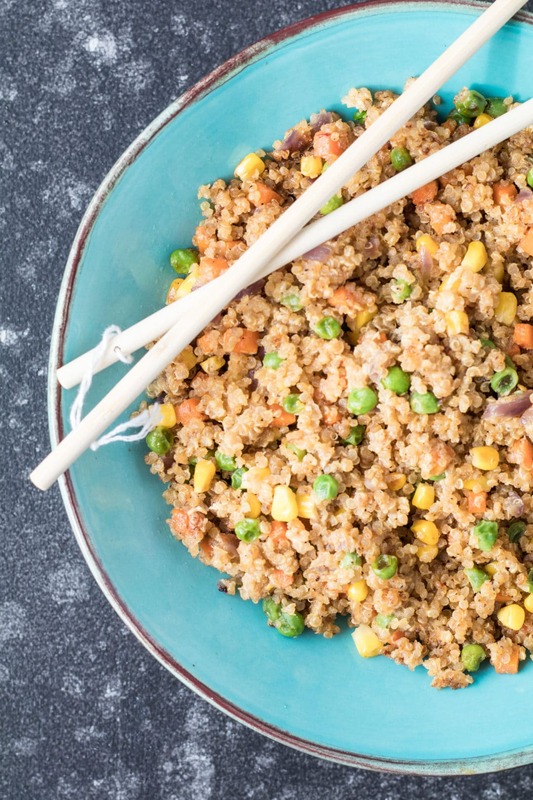 Quinoa Fried Rice is a fun alternative to the typical fried rice and will give you a boost of protein and fiber! 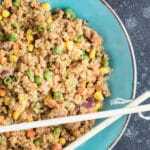 By now (2017), many people have heard of quinoa (But I bet you haven’t heard of quinoa fried rice!) Quinoa was a huge food trend for a while so I think most people are aware of this nutritious grain. It is a perfect grain for stove-shy cooks since it is essentially a just add water type of grain! It’s not as intimidating as one may think. Quinoa is super versatile too! I like adding it into my eggs in the morning, you can add it into salads, make tabbouleh with it, and much more. Plus, a little goes a long way since it is very satisfying. This recipe has no butter and minimal sauces added to it. 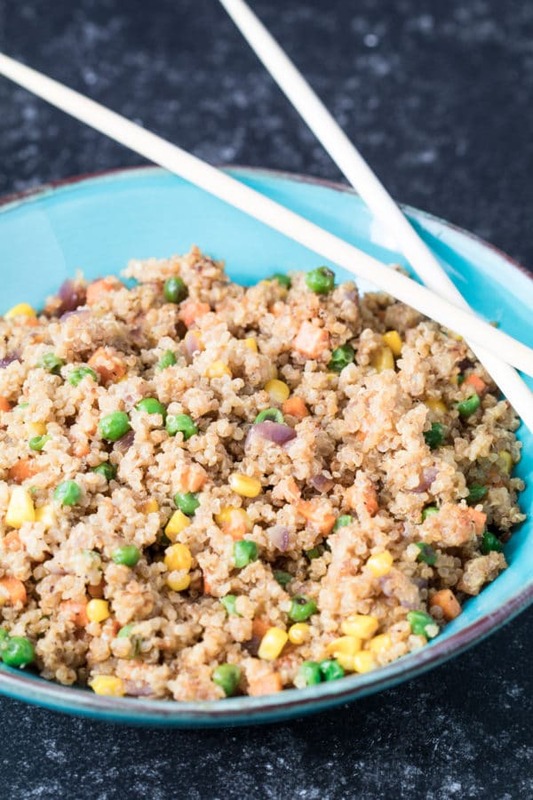 And clearly instead of using white rice I am using the quinoa for all of the health benefits it offers – like the protein and fiber I’ve mentioned, iron, magnesium, phosphorus, zinc, potassium and B-vitamins. I hope you enjoy this recipe!! Rinse and cook quinoa according to package. Once cooked, remove from heat, fluff with fork, place in a bowl and put in fridge to cool. Mix the 3 ingredients for the sauce together and set aside. Heat 1 Tbsp. EVOO in a wok on high heat. Toss in the carrots and the onions and cook for a couple minutes. Then add in the garlic, salt, pepper, garlic powder, red pepper flakes, and ginger and cook for 2 more minutes. Add the remaining EVOO and the quinoa. Add the sauce until nicely incorporated. Make a well in the middle of the quinoa to pour the 2 eggs. Pour eggs in and scramble. Once eggs have cooked, toss in the peas and corn. Mix together, enjoy warm! Yum, I love quinoa fried rice! And yes, the Japanese love their butter! Fried rice is one of my favorite dishes! Love this healthy upgrade! Awesome video and great meal idea! I’m cooking low carb now, as much as possible. How many carbs for this recipe? Excited to try this one, plus I’m a newbie cooking Quinoa.